Do you have a good nights sleep? I mean really? Most people experience sleep problems at some point in their life. Did you know that it's thought that a third of people in the UK have episodes of insomnia, but what is insomnia? Insomnia is difficulty in getting off to sleep or the inability to sleep for long enough periods without feeling refreshed. Insomnia is more common in women and is more likely to occur with age. There are many reasons for insomnia including stress and depression or something as simple as having too much caffeine late at night. Having a wind-down routine, a dark environment and supportive mattress all can help. When a bed is no longer providing support and comfort it can be to the detriment of your sleep. How long have you had your mattress? I know mine is at least 10 years old and is in desperate need of a change. I keep waking up at night as I feel I can no longer get comfortable. So I have been looking online for a new mattress. Have you ever thought of a pocket sprung mattress with memory foam? Pocket sprung mattresses are known for offering a responsive and supportive surface. Memory foam mattresses stand out for ensuring pain relief against so many agonising conditions. Now you can get the best of both world's with a pocket sprung mattress with memory foam. 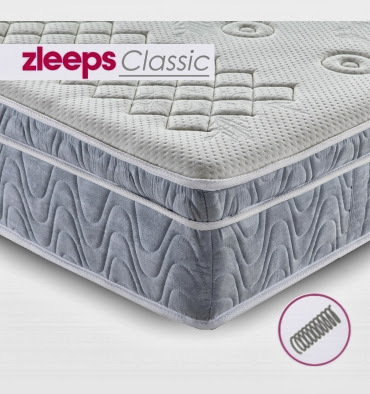 Zsleeps have mattresses to suit everyone whether you are on a tight budget or can afford a more expensive mattress with double memory foam mattress from only £129. If you are seriously watching the pennies they also sell memory foam toppers from £49. Memory foam mattress toppers create an extra layer of cushioning on a bed that feels too firm. They also say on their website that they give a No Quibble 60-night trial money back guarantee. They ask you to try their products for at least 45 out of 6- nights. More information is available on the no quibble guarantee on their on their website. With free delivery and a 10-year guarantee what have you got to lose and you can only gain a good night's sleep! Do you suffer from insomnia? Are you in the market for a new mattress? I have issues sleeping, but it is health related. I know my mum has one of these mattresses and finds it helpful. I think the toppers are a great idea and have been considering, but need to wait until we have more money! We definitely need a new mattress! The memory foam mattresses do look very good. Thank you so much Lucy, that is so lovely of you! Great post :) I go through phases of being able to sleep all the way through the night, but some weeks i'm terrible and can be woken up at 3am and not fall asleep. I think worrying about having to get up for work at 7 keeps me away, or stress. It always amazes me that people will spend a lot on a bed frame and then buy the cheapest mattress they can afford. It's really worth spending a bit extra, especially if you have back problems.